Local bakery, Classic Cake of Cherry Hill, NJ has received significant press coverage through television cooking segments, wedding magazine cake inclusions and a number of newspaper cake, cookie and dessert features. Due to the remarkable exposure – national cable network, TLC selected the venue for inclusion in their pilot cake program, “Fabulous Cakes” in which the executive chef and bakery were showcased in a 30-minute show. The result was incredible and led to an additional series of local press inclusions via MB and Associates including CBS3, Fox29, NBC10, the Philadelphia Inquirer, South Jersey Magazine and the Courier Post newspaper. Under the guise of influential executive pastry chef Robert Bennett, Classic Cake is quickly becoming a favorite among brides-to-be, regional households and the premium Philadelphia hotels. Chef Bennett not only develops unique dessert specialties, including chocolates, pastries, gelato, sorbet, cookies, cakes and pies, he also oversees the company’s artisan bread baking operations. His 30-plus years of culinary expertise propel him to be the driving force behind Classic Cake’s unique product lines. 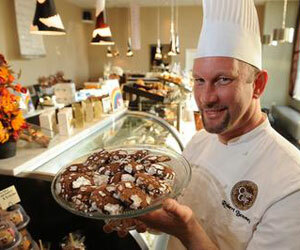 Chef Bennett is recognized in the industry as a true pastry expert. In 1989, he was U.S. team Captain for the Premier World Cup Pastry Championships. He was also named honorary member of the French Confederation Nationale des Patissiers, Chocolatiers. An active member of the culinary community, Chef Bennett was one of the original members appointed to the Board of Directors of the North American Pastry Chef’s Association. He is co-founder of the Philadelphia Pastry Society.